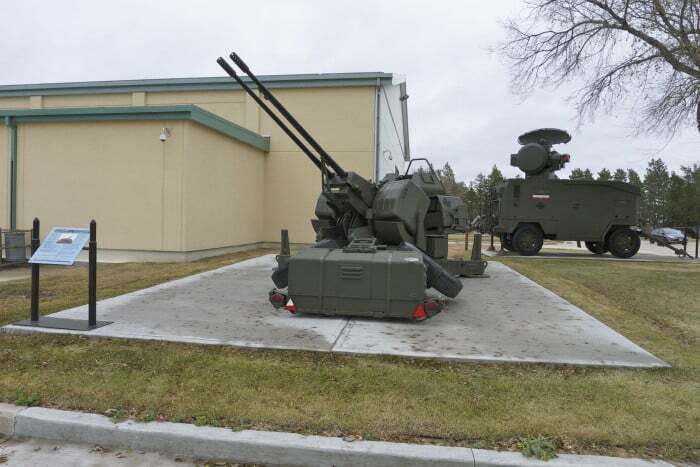 First developed in the late 1950’s, the Oerlikon 35mm is one of the most widely used modern anti-aircraft guns. Used by the Canadian Army 1989 to 2005, the guns provided low-level air defence for two Canadian NATO airfields in Germany. Normally controlled in pairs by a Skyguard radar, the GDF-005 was also fitted with a Gun King 3D computer controlled sight with a laser range finder and digital fire control system, allowing it to function independently if required. The Canadian batteries consisted of four Skyguard radars and eight GDF-005 guns. Guns captured from the Argentine forces during the Falkland War in 1982 were put into British service.